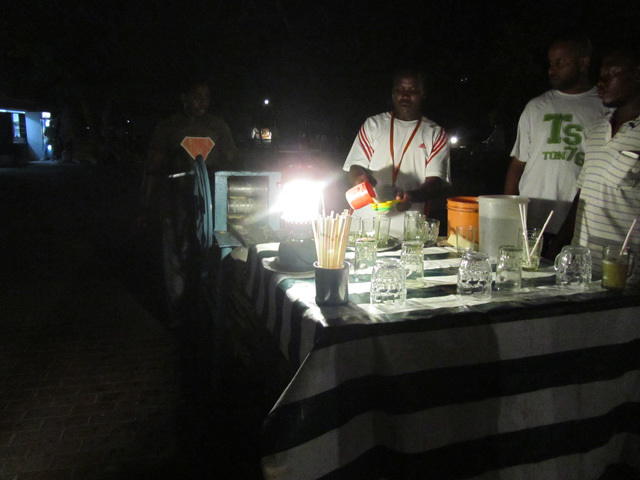 Stone Town Night Market - dark yet functioning! Like many destinations around the world, there’s no better way to get a grip on a culture than through its cuisine. The contribution of local Bantu food mixed with Arab and Persian flavors and Indian spices makes eating one of the most enjoyable things about Zanzibar! Being an island nation, the sea is also the number one source of food – and there’s lots of good seafood to dine on. When in Stone Town, one of the best places to get local style Zanzibari seafood is at the little night market near the old town walls on the waterfront of town. Each evening, stalls set up their street kitchen to deliver some of the island’s tastiest grilled and fried treats that will make your mouth and your stomach rejoice. The main event at the Stone Town night food market are the giant tables stuffed with almost every kind of seafood you can imagine. All you have to do is walk up to one of the stalls, choose as many skewers of food as you desire, have the vendor roast them on the grill, douse it all in their special sauce, and you’re ready to go. Last time I was there I ate multiple sticks of prawns, a few different kinds of deep seawater fish and a few of the outstanding marinated chunks of lobster (the red chunks on my plate). 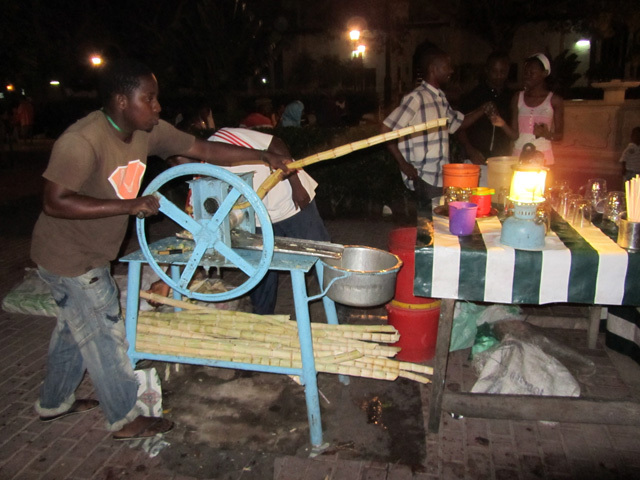 You can also try local Zanzibari raosted bananas, cassava or even french fries to go with your feast. An original Indian snack creation, samosas are little triangular deep fried dumplings filled with seafood, meat or spiced vegetables. The crunchy outer layer provides the casing for the tasting inner fillings. In Zanzibar, samosas are often served with shredded coconut chutney that magnifies their tastiness even further. We'll probably never know all the ingredients that go into the productions of a Zanzibar pizza, it’s kind of a mystery… and there’s no cheese involved. The process begins with little balls of oily dough that emerge from a little street side plasticware container. The vendor slaps the dough into a thin tortilla like shape and then fries it in butter on a hot griddle. He then cracks an egg into the middle, along with a mystery meat topping and a few other ingredients of your choice. A few other unknown ingredients are added, the dough is folded into a pod and an authentic Zanzibar pizza is formed. Hot, greasy and salty, you won’t find a better guilty pleasure or beer snack in all of Zanzibar! I’ve had sugar cane juice in a number of countries, but to be honest no where else makes better sugar cane juice than Zanzibar. Instead of just squeezing the sweet juice and serving it, in Zanzibar they combine the juice with a squeeze of spicy ginger and a squirt of lime so it’s soothing on the throat. It’s the perfect beverage to accompany all the salty fried food at the market. 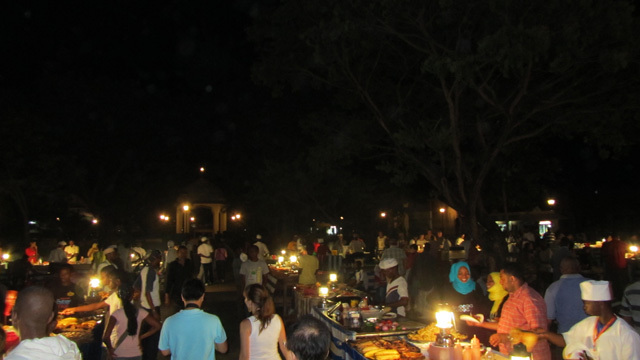 So if you ever visit Zanzibar and want to get a sample of the street food masterpieces, be sure to check out the Stone Town food market at night. Wow. I would love to experience this place. Dying to see Zanzibar. Cool Jeff, hope you’re able to visit Zanzibar soon! You’ll definitely find some great and fresh seafood in Zanzibar! I’m going in three months, woohoo! I can’t wait. 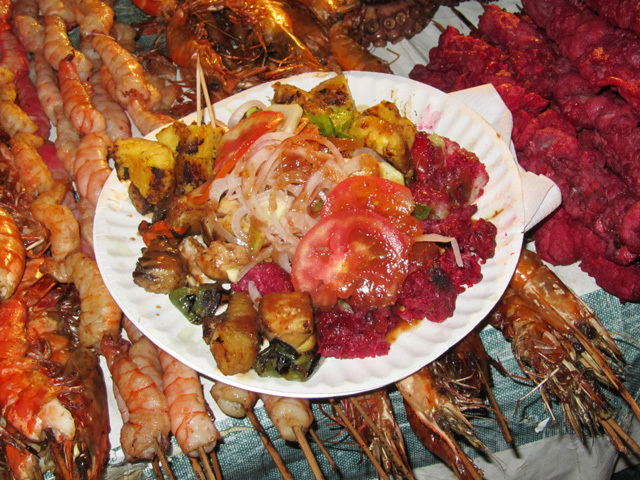 And I definitely can’t wait to try all this delicious food – get me to those night markets :)! What a great appetizer !